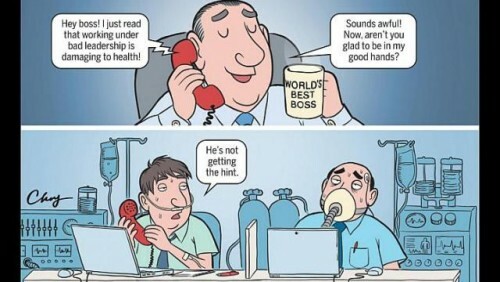 "The evidence is clear that the leadership qualities of 'bad' bosses over time exert a heavy toll on employees' health," says Dr Jonathan Quick, an instructor in medicine at Harvard Medical School and a co-author of the book, Preventive Stress Management In Organizations. "The evidence is also clear that despite the rationalisations some leaders may use to defend their stress-inducing, unsupportive style, such behaviour by leaders does not contribute to improved individual performance or organisational productivity." Research has linked having a lousy boss to an increased risk of heart attack, Dr Quick said. Chronic stress that can result when someone must deal daily with a bad boss has been linked to high blood pressure, sleep problems and anxiety, and is also associated with unhealthy behaviours such as smoking, excessive drinking and overeating. When 1,500 people were recently asked in an online survey about their workplace experiences for the American Psychological Association's 2014 Work and Well-Being Survey, nearly a third identified "problems with my supervisor" as a cause of work stress. Difficult bosses can come in many forms, including hypercritical micromanagers, inept managers, bosses who push blame for problems onto others or hurl obscenities, and those who make unwanted sexual advances. But researchers say that whatever the type, when employees deal with a bad boss day in and day out, negative health effects often pop up. One study published in 2009 in Occupational And Environmental Medicine analysed data on 3,122 men to see whether the leadership qualities of their managers were associated with a risk for fatal or non-fatal heart attack, angina and death due to heart disease. Men who rated their managers as good (meaning considerate, providing information, feedback and sufficient control to employees) had at least a 20 per cent lower risk of developing heart disease over a 10-year period than those who rated their managers as poor. Though the study did not prove causality, the association grew stronger the longer the employee stayed at the workplace. Dr Anna Nyberg, the lead author of the study and a researcher at the Stress Research Institute at Stockholm University, says there is an important takeaway: "The longer you have worked at a workplace, the better or worse the situation becomes. "So if you are working under a boss who stresses you in a destructive manner, and your possibilities or chances to change the situation are limited, you should try to change jobs as soon as possible." While changing jobs when faced with a bad boss is often the quickest way to restore your health, other approaches can help when quitting is not possible, says Dr Richard O'Connor, a psychotherapist in New York. If there are people you trust at the workplace to talk to, for example, you may be reassured to learn that they are having similar conflicts with the manager, he says. That by itself can reduce stress. "One of the ways that bad bosses work is through splitting people," he adds. "They play favourites and develop a network of informers, so that you don't trust anybody and you really do feel more isolated. You feel that there must be something wrong with me because everybody else seems to be getting along okay." Ms Emily Wilson, 25, a communications professional in Washington, says she once had a micromanager boss who humiliated her in meetings by routinely dismissing her suggestions and commenting about errors she had made. She says the anxiety she experienced caused her to suffer panic attacks: "I felt like I couldn't breathe, and I could barely talk." She left that job after five months and hasn't had a panic attack since. When Mr Darryl Defilippi, who lives in Woodbridge, Virginia, was promoted to assistant manager of an automotive retail shop earlier in his career, his supervisor constantly pushed off his own responsibilities and did not provide any training. This led to anxiety, the loss of a relationship and insomnia, says Mr Defilippi, who is now 30. He was able to get transferred about six months later to a different location and began working for a better manager. There, his health issues soon cleared up. People who have bad bosses often describe the situation as a living hell, says Dr E. Kevin Kelloway, Canada research chair in Occupational Health Psychology at St Mary's University in Halifax, Nova Scotia. "From the time you get out of bed, you're dreading going to work." This produces a fight-or-flight response, which causes your body to pump out adrenaline and other stress hormones - just as it would if you were running from a tiger baring its teeth, he says. "If a tiger is chasing you, then it's appropriate to run away," he explains. "But you don't get to run away from your boss."